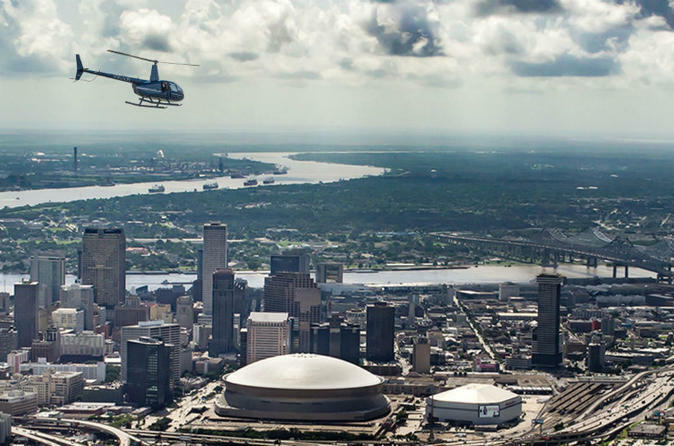 This one of a kind helicopter experience takes you eye level with the tallest buildings in the Downtown area and above neighborhoods such as Uptown, The Central Business District, and the French Quarter. You will also fly high down the Mississippi River on your way to view the wetlands of Southern Louisiana like you've never seen. Come to see this magical city from an entirely new perspective. Our offices are located at 8221 Llyod Stearman Drive (James Wedell Hangar) off Igor Sikorsky Drive near Lakeshore Landing. Parking is available on site. Your tour will depart from the Superdome downtown heliport at 1500 Sugar Bowl Dr . The downtown heliport is on the top level of Superdome parking Garage 6 on the corner of Poydras Street, which runs parallel to Sugar Bowl Drive, and South Claiborne Avenue. Access is via the stairwell marked “New Orleans Downtown Heliport” located to the right of the Superdome on the Poydras St. side. When you arrive you will be greeted by a ground crew member to let you into the heliport. Our ground crew will then go over a quick safety briefing and assist you into the aircraft. After this you will embark on your flight over the downtown area!